Steven J Pemberton was born in England in 1970, the son of a librarian and a teacher. It was probably inevitable, therefore, that he would grow up loving books and the imaginary worlds they conjure. He now lives in Hertfordshire with his partner, where he works as a software developer. Visit Steven's website at http: //www.pembers.net for bonus material for this book and information about new releases. Pemberton is a fine writer, with some great ideas here. I love the juxtaposition of advanced technology coupled with magic. I look forward to reading the next book in the series! 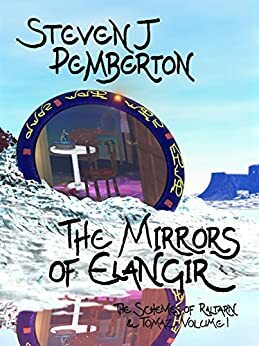 Pemberton's 'The Mirrors of Elangir' is a thoroughly enjoyable adventure with a great deal of fantastical twists to shrug off any easy cliches that so many authors fail to avoid. Well paced throughout, Pemberton succeeds in avoiding making his reader wish to hurry things up (or perform the dreaded skip to the end) or pray that he had slowed things down. Without revealing any of the plot, you are hooked and reeled into an imaginative universe, familiar in the trivial ways that make you feel fluffy and warm, and original enough to make you ask questions and look forward to future installments. The book serves as an introduction to a series which will undoubtedly be one to continually look forward to!